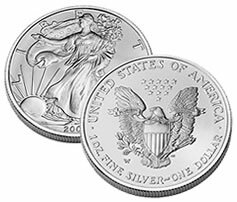 Bullion 2009 American Silver Eagle coin sales have been on fire this year. Eight of ten months were "best ever" records. 2009 has already been crowned the top-selling year of all-time, and that was back in early October. For a series which began in 1986, nothing underscores the demand for the silver eagles better. Their values in the upper grades are nothing to laugh about either. In our latest installment of analyzing recently sold coins on eBay, we took a 40-day snapshot (Sept. 28 to Nov. 6) of more than 5,500 completed auctions of 2009-dated American Silver Eagles. What we found, and as coin collectors would naturally expect, is that there are significant rewards in selling graded MS70s. But how values have changed over the 40 day period is illuminating. Especially in regards to the harder to get PCGS "First Strike" designated eagles. 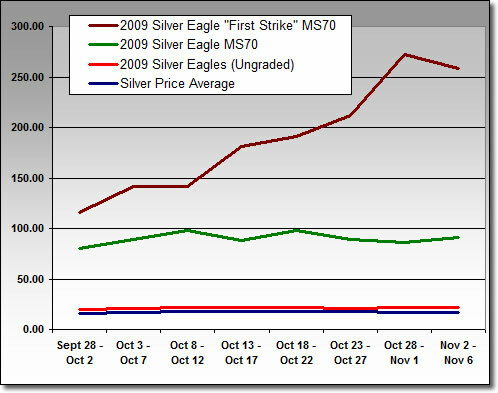 As is typical, the premiums for ungraded Silver Eagles hovered just above the current market price of silver. Our 40 day sampling of data from some 4700+ completed listings shows premiums of between $3.00 and $4.90 above the London Fix price of silver. Unlike the ungraded examples, MS70 Silver Eagles enjoyed solid premiums. In examining over 800 sold listings on eBay, realized prices above silver’s cost ranged toward $60 from the bottom of the scale to an upper reading of just above $76. The biggest winner in the bunch is clearly Silver Eagle "First Strike" PCGS MS70s. Our sampling base was much smaller at under 50, but sold prices reflected a sharp upward trend during the 40-day period, with the low premiums around $100 in early October and the highest prices reaching just over $250 in late October and early November. As a side note and for consideration when reviewing this information, it can be a difficult proposition to collect and analyze completed auctions for certain types of coins on eBay. The process is not perfect nor completely encompassing. Sellers list auctions differently and often use a variety of descriptions. In all cases for the above data sets, researched filters were used to collect the widest range of data available during multiple 5-day windows at the time of sales. Averages for those data sets were used. In an attempt to compare apples to apples, listings with multiple eagles were excluded. Likewise, the data for MS69s was dropped, as the focus was to compare the bottom and upper tier premiums. * As of Nov. 13. Because of unprecedented demand for American Eagle Gold and Silver Bullion Coins, the United States Mint suspended production of 2009 proof and uncirculated versions of these coins. Both laws direct the agency to produce these coins in quantities sufficient to meet public demand. The proof and uncirculated versions of the American Eagle Gold and Silver Proof Coins are not mandated by law. Which is better to collect,,,, Silver Eagle Proofs ‘or’ Silver Eagle ms70 ? ?